Dunhuang, China -- Today Dunhuang is home to a wealth of accumulated Buddhist art treasures. They are housed in 812 cave temples located in northwest China's Gansu province. 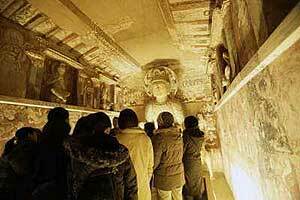 << Dunhuang is home to a wealth of accumulated Buddhist art treasures. They are housed in 812 cave temples located in northwest China's Gansu province. Hundreds of years ago an oasis in the Gobi Desert rose to prominence as an important stop on the Silk Road. Today Dunhuang is home to a wealth of accumulated Buddhist art treasures. They are housed in 812 cave temples located in northwest China's Gansu province. For over a thousand years, the steady influx of Buddhist thought came in the waves of monks, who traveled to the little town from India and Central Asia. Here, the monks established extensive cave monasteries and created caches of distinctive Buddhist arts. Indigenous Chinese culture was blended in with the works. Many of these objects are gathered in a newly opened exhibition: The Lights of Dunhuang at the National Museum of Fine Arts, in Beijing. As they enter the gold and crimson-hued halls, visitors are immediately awed by the sheer size and quality of the collection. The chronological sweep and the breadth of the artworks are revealed in ten vividly-recreated caves. There are thirteen replicas of ancient sculptures, nine originals and one hundred mural copies. All are artfully arranged throughout the entire first floor. Viewers in the market for pure visual excitement are not shortchanged. This mammoth sleeping nirvana, vast in its size instantly evokes a mixed sense of respect and dread. Stretching over 1.8 meters in width, this statue replica was originally housed in Cave 158, at the south end of the Mogao Grottoes. "Story of Buddha Preaching" was painted on the adjacent wall. The cave is one of the most important nirvana caves carved during the reign of the Tibetan Kingdom of Tubo at the end of the 8th century. 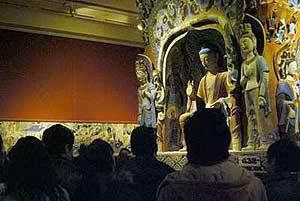 The bulk of the caves being recreated are from the Mogao Grottoes. At this stop on the Silk Road, 492 cave temples are carved into a cliff face extending over about 15 miles. The elaborate murals covering the caves are portrayals of heaven and earth as viewed in ancient China. Covering a vast 50 thousand square meters in total, the murals have sustained damage from the biting winds, sand, salt and water. Tourists cause their share of damage. Protection of the murals is paramount. The job has been taken up by technicians from the Dunhuang Academy, which was established in the 1940s. And the result is a complete system of faithful reproductions. .
Murals from the famous Library Cave possess an encyclopedic wealth of knowledge. Its discovery not only fuels the spread of Dunhuang-ology, but also draws aspiring Chinese artists, the way a shrine might inspire piligrims. Among them is Fan Jinshi, a petite, feisty archaeologist who now heads the Dunhuang Academy. Often considered the guardian of Mogao, Fan says this exhibition, the largest display of Dunhuang art, means a lot for her fellow workers and many more coming to ancient town of Dunhuang. Fan Jinshi, Director of the Dunhuang academy said, "It is a significant exhibition in that Dunhuang art has finally stepped outside the little town, to the Capital, to the country, and hopefully to the world. Our staff members have devoted every bit of effort into the protection in the sacrifice of their family life. This has been a sustained problem. The exhibition is a comfort for them. But cooperation with international units is continuing, and we are pledging ourselves into the cause in the years to come." Fan Di'an, director of the National Museum of Fine Arts, was glad to trace the historical bond with the institution and Dunhuang back into the 1950s. 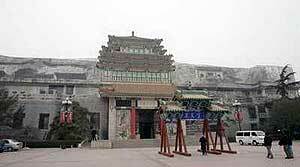 The eves of the building are molded in the shape of the Mogao Grottoes. The innovative design has earned the building a spot among the Ten Top Architectural Structures in Beijing in 1959. For its opening exhibition in 2008, and the grandest so far, the National Museum of Fine Arts has repackaged its facade, re-tiled the floors and refurbished the ceilings and walls. Fan Di'an, director of the National Museum of Fine Arts, said, "As an important Chinese cultural heritage, Dunhuang art has had a sustained influence the world over. On display is the cream of a thousand years of architecture, sculpture and painting. We hope this will be a rich and unforgettably emotional experience for all." Literally translated as the "blazing beacon", Dunhuang art inspires and excites artists as well as common folks. Here in the exhibition hall, visitors discover a whole new dimension to their culture from a far gone time. They are taken to the height of Dunhuang art, where excitement lies at every glance. Lights of Dunhuang runs at the National Museum of Fine Arts until March 21st.